If you’ve been following my blog over the past year, you’ve probably noticed that I have succumbed to an addiction. Yes, it’s true. I’m addicted to Iron Orchid Designs Decor Transfers. I discovered them back in March when I saw one on a Facebook group I belong to, How to Paint Like a Pro. I promptly ordered two of them online. 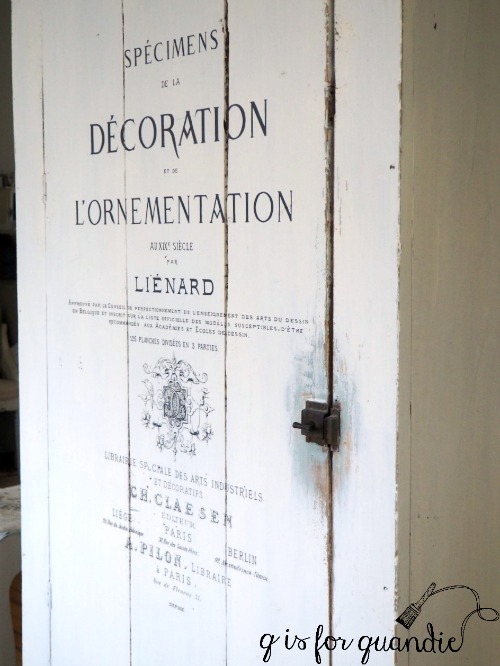 My first project with a Decor Transfer was the cupboard where I store my painting supplies (well, to be honest, just some of my supplies fit in this cupboard, there are two more cupboards full of supplies in other rooms of my house, who’s with me on that one?). 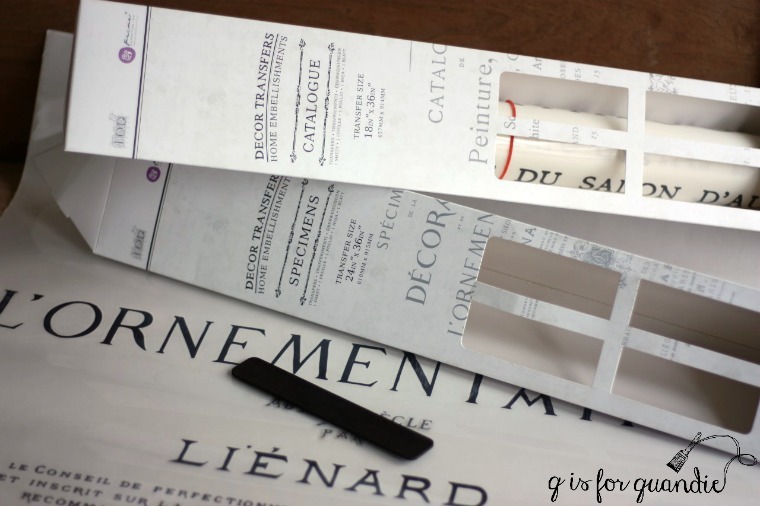 I love these Decor Transfers so much that I went on to do countless projects with them over the last 8 months (some of my faves can be found here, here, here and here). So you can just about imagine my delight when I found out that Fusion and Iron Orchid Designs/Prima Marketing were teaming up. Now Fusion retailers have the option of also stocking the IOD Decor Transfers. And as an official Fusion Mineral Paint Blogger, I was offered the opportunity to receive some IOD products to try free of charge! I believe I did a little happy dance when that message came across my computer. But then I was stopped in my tracks by that word, ‘try’. Hmmmm. I have to admit, I felt like I would be a bit of a fraud if I sent back a big list of Decor Transfers that I wanted to ‘try’. After all, technically I’d already tried almost all of them, many of them more than once! And some of the ones that I hadn’t tried yet, I already had in my cupboard (yes, that same one shown above) waiting to be used on something. I’ve had poor Mr. Q ordering IOD transfers for me via Amazon for months (he himself is an Amazon addict). So it felt a bit greedy to ask for more! But guess what? 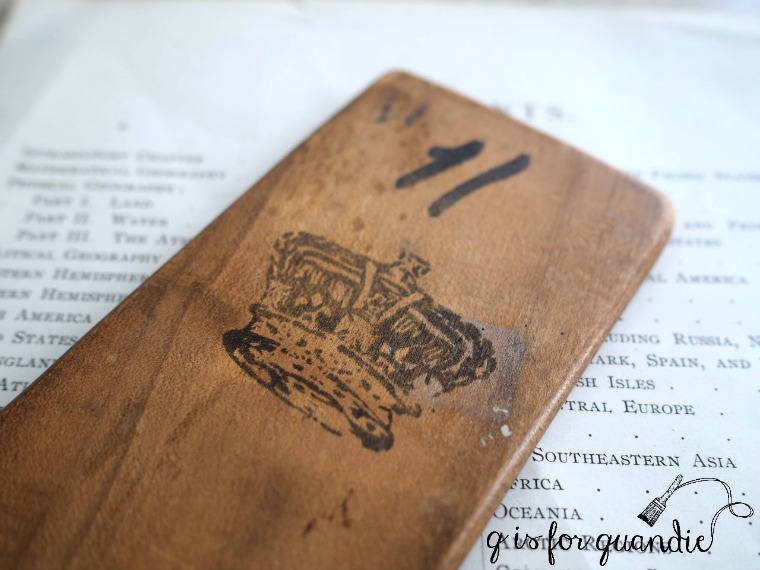 Prima Marketing and IOD have some other cool products too, like their Decor Stamps. These are stamps that are designed and sized appropriately for use on furniture or for other home decor applications, like walls for example. So, ding, ding, ding, we have a winner! I asked them to send me some of their Decor Stamps to try, as well as their 10″ x 12″ acrylic stamp block. 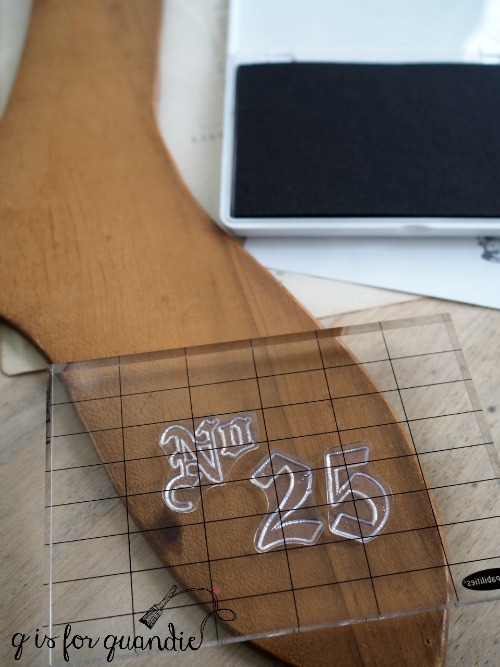 If you are not familiar with changes that have been made in rubber stamps over the past number of years, you may not be aware that many of them no longer come adhered to a wood block. Now they make them out of a sticky rubber-like stuff that sticks well to a clear acrylic block, but also peels right back off again. It’s so much easier to store lots of flat sheets of stamps and just one acrylic block (or several of differing sizes). When my box arrived from Prima Marketing it was like Christmas came early for me. I immediately opened it up and started fondling the supplies. I decided to try a quick little project just to test them out. 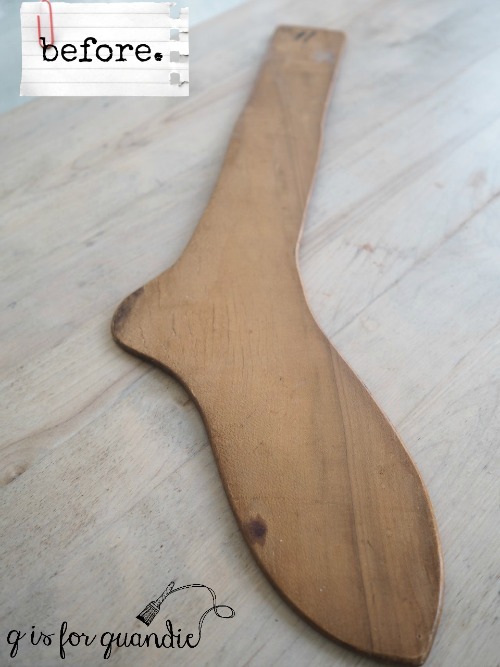 I purchased this wooden sock stretcher at a garage sale last summer. Back in the olden days when socks were made with wool, after you washed them you then put them on a sock stretcher while they dried. That would ensure that the sock didn’t shrink up and no longer fit. 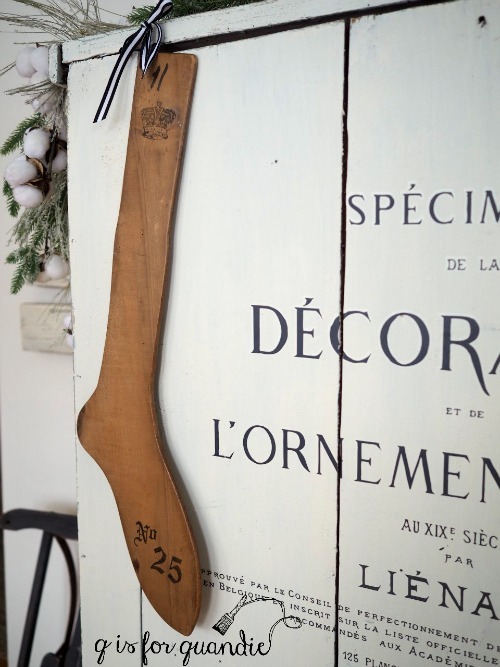 But when I see these old sock stretchers, I always immediately think ‘Christmas decoration’. So I thought I would use the IOD stamps to give them a little more Christmas style. I started by laying out my design right on the sock stretcher. This way I could move the stamps around and make sure they fit where I wanted them. These stamps are from the Alpha II set, by the way. Once I had them where I wanted them, I simply placed my acrylic block (this is a block I already had, I didn’t need the big 10″ x 12″ IOD block for this small design) over them and pressed down to attach them to the block. Next I lifted them off the sock stretcher and inked them up. Although Prima Marketing/IOD does currently carry some inks, and they did send me a couple, they are not going to continue to carry ink in their line up. So I went to my local Michaels and purchased some Ranger Archival Ink in a color called Watering Can. 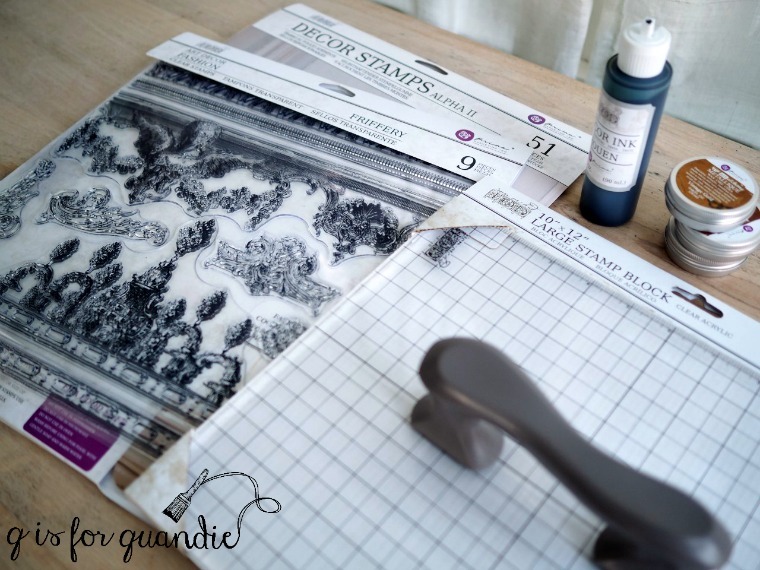 You can use any kind of ink with the stamps, but be sure to choose one that is suitable for your project (especially if you are stamping fabric, which I hope to try soon). In this case, I went with a permanent, waterproof ink. 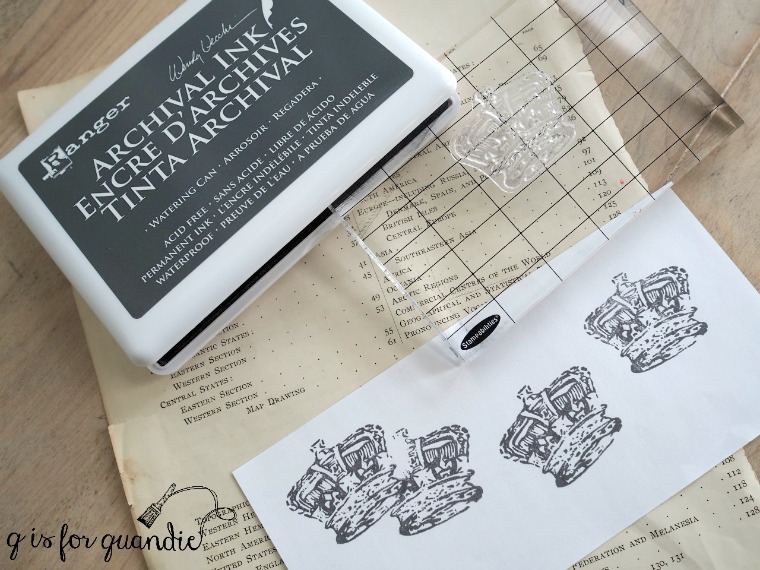 You should absolutely test out your stamp on paper a couple of times before finally stamping your project. That way you can get a feel for it, and work out any kinks. You can see if you are getting enough ink on your stamp as well. Always be sure to have your project on a hard, flat surface when stamping. 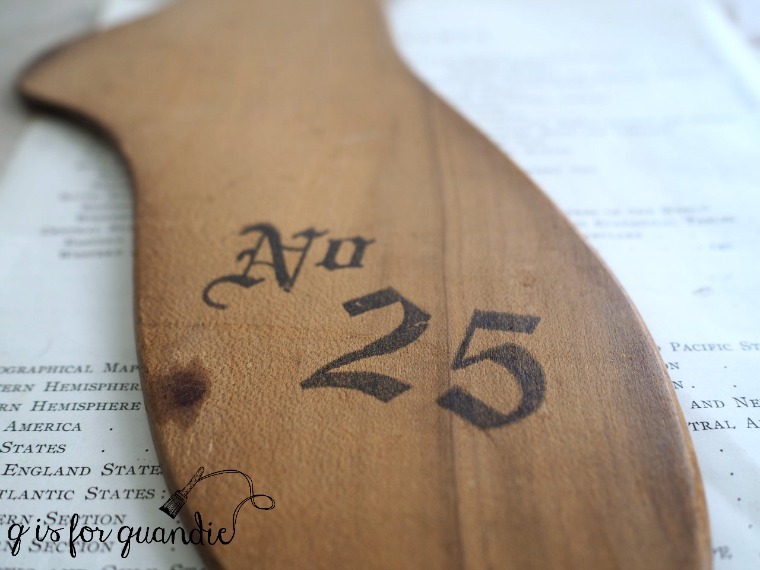 Of course, if you’re stamping furniture or walls, they will be their own hard, flat surface. Finally, ink up your stamp again, place it where you want it and press down firmly. I usually avoid rocking the stamp back and forth because that can blur your design. Just press firmly straight down. I added this sweet little crown to the top of my sock stretcher. The crown is from the Grain Wreath set. What I love about this is that the crown doesn’t look ‘new’ or recently added. It looks like it could be an original detail. Next I attached a pretty ribbon and hung my ‘sock’ up on the aforementioned cupboard. This was a pretty simple, basic project using the stamps. As you can imagine, the sky is the limit design-wise, but I wanted to start out with something easy to get my feet wet (or get my wool sock wet?). I’ll be sharing a slightly more advanced stamping project soon. But in the meantime, I’m almost entirely happy with my sock stretcher except for one thing. I think she looks kind of lonely hanging there all by herself. She needs a mate, don’t you agree? I’ll definitely be keeping an eye out for more sock stretchers during next year’s garage sale season! 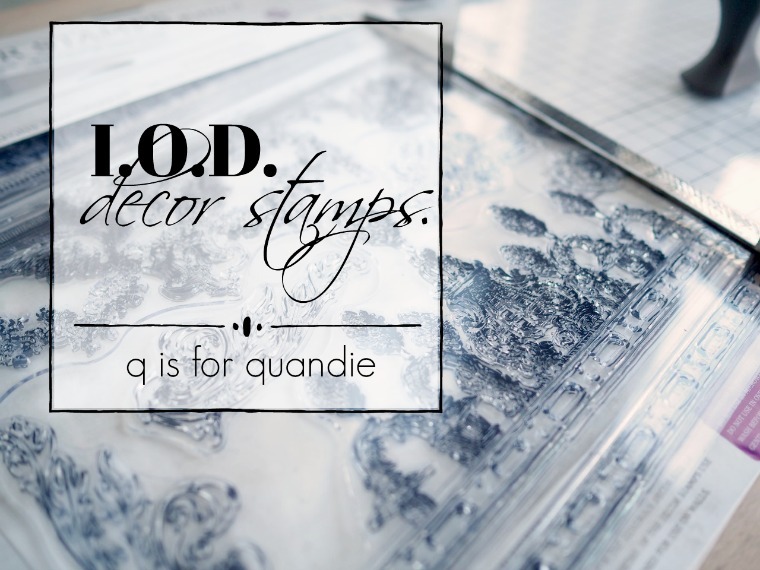 In the meantime, have any of you tried the IOD Decor Stamps? If so, I’d love to hear about your project, so be sure to leave a comment. Previous jodie’s house, part 2. It looks really pretty hanging on your cabinet, Linda. Love that garland too. Thanks Becky! I found that garland at an after-Christmas sale last year. My first thought was you didn’t paint it first but after seeing the stamp on it, it looks good. The ribbon added a bunch to it. My second thought after seeing it hanging was wow that’s gigantic. I don’t think I have ever seen one before. You’ve caught on to my secret plan, which was to test the stamps on the unpainted piece first. If I didn’t like the way they turned out, I figured I could always paint the entire thing and then start over. But as it turned out, I loved the result the first time around! Am I the only one who noticed the awesome black and white ribbon attached to the sock? Love it! Not sure why that was the first thing that caught my eye. 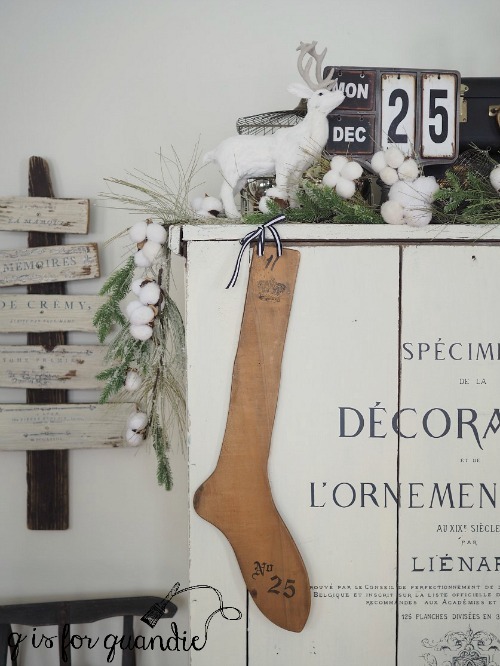 Love the sock against your cupboard…hope you happen upon another sock mold…pretty cool! It’s that graphic punch of black and white, it always draws the eye! I’ve got a stash of that ribbon that I keep on hand for all kinds of things. Amazing. I just bought 3 of those socks! I knew that I wanted to use them for Christmas. I love the simplicity of the stamps. Thanks Linda. That’s awesome that you have 3 of them Monica! Your socks won’t be lonely like mine is 😉 I love the simplicity too. Even just adding the crown alone would have been a nice touch, but I think the No. 25 helps it feel a tad more Christmas-like. I like the wire stretchers too, although it’s harder to come up with a way to spruce them up for Christmas. Perhaps with just a sprig of evergreen and a pretty ribbon at the top? I think pairing up wire sock stretchers with one or two wooden versions would be a fun look too. Go save those from the basement! 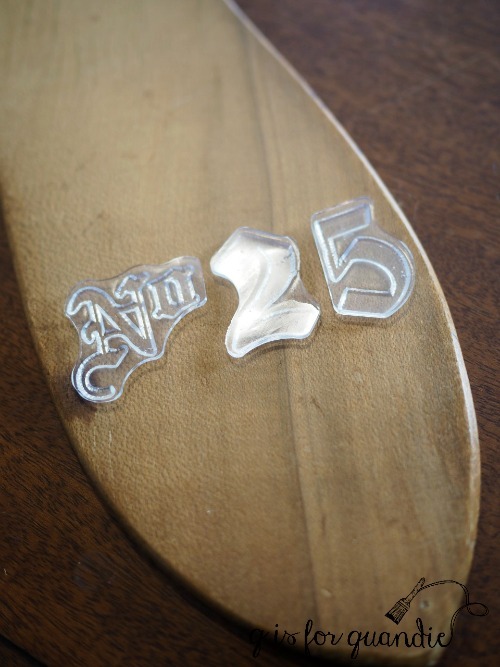 The best thing about the acrylic block versus the old wood block is that you can see where you are stamping. I might add, because of one of your blogs using an IOD transfer I have ordered one for a tea keeper I’m painting, a box that I have painted to store all our various teas in as the cupboard was getting a little messy as we sift through them to find the tea we want. This way, the tea containers sit down in the box and we can read the labels when we lift the lid. P.S. The sock stretcher is very cute. Yes, I agree totally about the see-thru quality of the block. It’s so much easier to keep your stamp straight when you can see exactly where it is going! I love your idea for a tea keeper, I am sure it will be fab! The sock stretcher is pretty subdued, but does look like the design is original to the age of the stretcher. Will be checking them out as I like the idea of reusable versus on two uses with the graphics. Yes! Excellent point Sugar. I will be sure to make that point when I post about using the stamps on furniture. Unlimited usages makes them a great value for the cost. Really a cute idea! I have never seen stamps like those. I too like that you can see where you are stamping. I have seen very few sock stretchers except in old magazines, now I would like a pair or two! You’ll have to keep your eyes peeled for some sock stretchers now! I love the sock stretcher and the details. You are so creative! I have never used the stamps before, so thanks for the tutorial!! Hun, have you seen my sock stretchers anywhere? My wool socks are fitting a little too tight. Dang it, I just had them the other day! That looks like a fun technique! The piece looks beautiful!